July is starting out to be a real scorcher! But, we have air conditioning in the Shop and we are staying cool. Your welcomed to join us in this nice cool fabric cave. Being part Husky, I'm not overly thrilled with this hot weather. Mom finally put in the air conditioners in the windows at home yesterday. My sisters and I have to sit on the sofa or chair when Mom is lugging the air conditioners around the house. She says we might trip her and we would all get hurt if she tripped over one of us carrying an air conditioner. Onto the news around the Shop. Last week Mom left my siblings and I to go to Janome for sewing and embroidery machine service and repair school. Grandma stayed with us. But I really, really missed my Mom. I moped around all week. She has never left me for that long before. I was soooo excited when Mom finally came home. I didn't think she was ever coming home. Mom said that going to just outside of NYC the week before a holiday wasn't such a great idea. She said even though they got out around 1:30pm and she took an alternate route home, there was a lot of traffic heading away from the cities. New Christmas fabrics are starting to arrive and they are on the shelves. We also got in a new fabric with wine corks on it and our new Valor digital print panel. It's huge! 36" X wof. 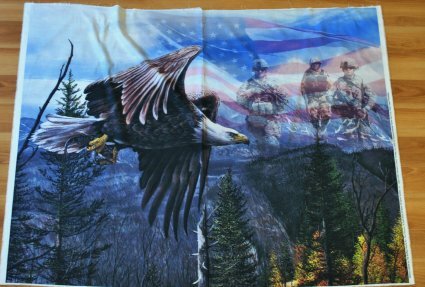 It would make a fabulous center of a Quilt of Valor for a veteran or a quilt to show your support of our Country and the service men and women who protect us. This Saturday....July 7th is our FREE PATTERN AND DEMO DAY 10AM-11AM Get a free pattern and learn how to make the first block. Grandma will show how to use specialty rulers and shortcuts to make the block. Mom will teach you the basics on how to clean your best friend in between professional cleaning services. Every project cleanings will help keep your bestie to keep working and help prevent damage done to your sewing machine. Mom will show where you can get into your machine to clean it, where not to go and what you can use and shouldn't use to maintain your best buddy. Basic maintenance will not replace having it professionally serviced but it will help your sewing machine to work at it's best. We would like to remind you that we are a Necchi sewing machine Dealer. Necchi is a Division of Janome. The Necchi line carries sewing machines and serger. The line currently does not carry embroidery nor embroidery/sewing machines. They are made in the same factories and same quality of Janome sewing machines. Mom had hear many stories from customers of their sewing adventures with their high quality newer and vintage sewing machines. Mom was touched by the bond sewers have with their sewing machines. 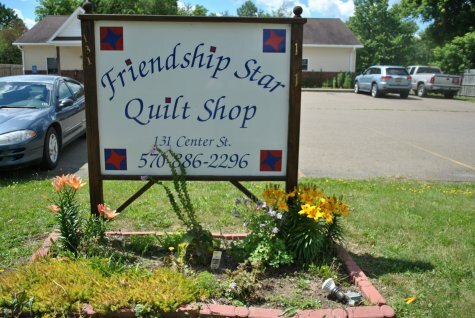 She wanted to provide our customers with high quality sewing machines for your sewing adventures. She realized people were not going to get the same quality and fun from big box store sewing machines. She wanted our customers to be able to get a high quality, dependable sewing machine without having to travel several miles away. As a Division of Janome, Necchi provides that quality and as a smaller line of sewing machines, it was an affordable avenue for us to be able to provide you with dependable, quality sewing machines and to have excess to a wonderful support partner in any technical support needed in regards to our sewing machines. We hope keep you us in mind when looking to upgrade or replace a sewing machine. I think I have covered all the happenings around the Shop. We hope you will stop in to visit us soon and enjoy our air conditioning.